Scarlett Johansson is talking about her tattoo. First noticed when she wore a sleeveless gown to the premiere of "The Other Boleyn Girl," the tattoo is explained in detail in the new issue of "Allure" magazine. Looking like a crayon drawing, the tattoo depicts a sun rising over the ocean with a background of clouds and a shining star. Asked about the meaning, Scarlett Johansson replied, "It's kind of personal. It's a sunrise, and it makes me happy when I look at it." 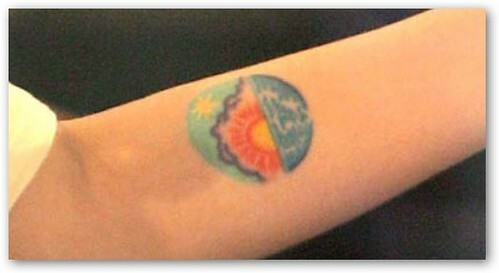 Although she doesn't elaborate, the tattoo looks suspiciously similar to Barack Obama's "O" logo, which features a sun rising over a striped red-and-white land. During the campaign, the "Lost in Translation" star had claimed to have Obama's personal email address, but this was denied by his campaign.